I hate using my flash. Nothing destroys a picture more then the shiny foreheads, reflective eyeglasses, and the nuclear glow that show up in my pictures every time I pop open the built in flash. Now I know there's a way to intelligently use the flash in your photographs. My friend, Robert Lachman, is a wizard at it. Unfortunately, I am not. I would like to say this is a result of the fact I'm too cheap to buy a separate flash for my camera but, most likely, it boils down to fundamental incompetence on my part. So my way to get around this problem is to simply not use the flash. And my number one tool for this strategy is my very favorite lens, a 50 mm 1.4 aperture lens I affectionately call the “nifty fifty.” This lens opens so wide, that I can use it to take dark pictures indoors and usually get away with it. My secret, in addition to the nifty fifty, is my complete lack of respect for the ISO setting on my camera. I often crank up the ISO setting to 400, 800, and even 1600 in effort to avoid using the dreaded flash. The result of these high settings, however, is that the pictures come out noisy artifacts, grain, and otherwise don't seem to cut the mustard. Newer cameras address this problem with better software and sensors that take much less grainy photographs at very high ISO settings. While I'm not in the market for a new camera, I sure would like to get rid of that noise. There just happens to be a software package made specifically for this problem. I'm talking, of course, about Noise Ninja. Noise Ninja is a well regarded stand alone application and Photoshop plug-in that allows you to remove noise from high ISO pictures. Recently, a new version was released that includes an Aperture plug-in. 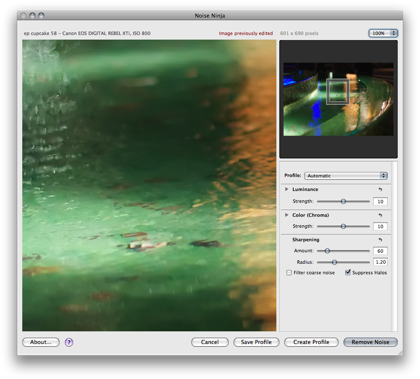 So now, as an Aperture user, I can round trip my photographs through Noise Ninja without exiting the program. Let me just say that this plug-in delivers. It allows you to send and multiple selections of photographs and applying Noise Ninja's secret sauce that does a very good job of taking noise out of my photographs. It is painless to apply and provides noticeable results. There really isn't a lot to say about this application except that it works and is easy. My attempts to repair noise with the built in Aperture filters often noticeably blurred the picture. Noise Ninja does a much better job at retaining the image integrity. If you are adventurous with the ISO button on your camera, using Noise Ninja, you will be able to recover otherwise unusable photographs and you will find yourself becoming even more liberal with your ISO settings knowing you can remove a lot of the noise back on your Mac. Any pictures I now shoot with 400 ISO or greater now automatically get Ninja’d. Noise Ninja can be purchased at picturecode.com. There is a free trial and I highly recommend giving this one a try. The Noise Ninja stand alone application can run on OS X, Linux or Windows. They have plug-ins for Photoshop, Photoshop Elements, and Aperture. They also have a variety of licenses ranging from $35 to $80. You can listen to this review on MacReviewcast #173.